Viking Golden Ale Malt is made from 2-row spring barley. Malting process parameters have been chosen to promote high degree of modification for easy processing. Viking Golden Ale Malt has reduced enzymatic potential. Strong flavor contributes malty, cookie, sweet and nutty notes with great balance of those. 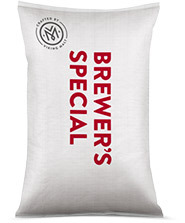 Golden Ale Malt is ideal for ales and special lagers. The coloring power of Golden Ale Malt is not too high, which makes it also suitable for subtle color correction of regular lagers giving noticeably hue towards gold. For all kind of beers but specially golden color ales and lagers. Usage rate up to 50%.